When you buy or receive something, really look at the packaging and think of how you might use them. If there are styrofoam peanuts, get a trash bag and start collecting them. Save those bubble lined shipping envelopes to reuse. Just put a label over the old one and there you have it! Save any box that is clean, sturdy and of a size that might be useful. Cut the taped edges and flatten for easy storage under a bed or behind a large piece of furniture. Save any twister ties to reuse. When you need a box, if you don't have one that fits, use a knife and alter the box you have to fit then tape it well. The next time you need to pack or ship something you won't need to make a trip to the store, no cost for the packaging, and you will have used them an additional time before they add to a land fill. The total cost was $0 and time spent was about 10 minutes! And how is this inspirational? We are to be good stewards of all God gives us! This is not only saving money, but recycling! Praise the Lord in ALL THINGS! If you'd like more of these, let me know and have a super day! 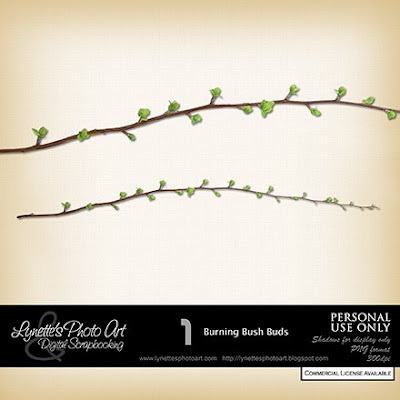 Today I'm giving you a sweet Burning Bush Leaf Buds Branch. 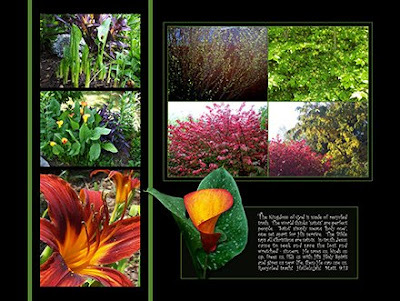 This is a page from my book showing the life cycle of this extraordinary bush - and no, I didn't enhance the color it is in the fall! Now you see where it got it's name! Thanks for the branch, it's lovely! The splendid colours of your garden are Nature's clothes of the bright seasons ! I so love your stuff. It catches my eye everyday on Digifree. Any chance of making some CU. I need CU for the freebie kits I make. Thank you so much for all your freebies! Thank you so much for this Freebie. I want to let you know that I posted a link to your blog in Creative Busy Hands Scrapbook Freebies Search List, under the Elements or Papers post on Aug. 09, 2009. Thanks again. Thank you so very much for ALLL the GREAT goodies you share! :) Have a SPLENDID evening! !